I spent most of the week in sunny Las Vegas. It was a combination work trip and vacation. The first 2 nights I was there for work and stayed at a new hotel called the Linq which is right next to Harrah's and the Flamingo. It's also right next to a new attraction called the High Roller! The reason for my trip was to attend NAB 2015 also known as the National Association of Broadcaster's convention. I had never been to this show before, but it was incredibly cool. It's targeted at members of the broadcasting industry and I saw people there from Universal Pictures, ESPN, Fox Sports, and about 1000 TV channels from all over the world. They were all there to see the latest and greatest technology available in broadcasting. The show did not disappoint. I saw an incredible range of massive LED screens featuring 4K and 8K video footage. If you think our lives are smothered in video content currently, you ain't seen nothing yet. These screens look like windows into another world because their images are crystal clear and they just keep getting bigger and bigger! My favorite new technology is Virtual Reality and there were several companies at NAB doing demonstrations. It has been about a year since I'd last seen an Oculus Rift demo and I'm pleased to say the technology continues to advance. I saw incredible 360 degree videos of movie trailers, animated roller coasters, and best of all my first experience with what watching sports will be like in virtual reality. It's absolutely incredible! NextVR mounted a VR camera on the side of a hockey rink during an NHL game. It feels like you're actually in the rink because you can look around and see every inch of it while the game is being played. This technology is going to change our lives. Another awesome new technology that seemed to be everywhere was drones. There had to be 50 different booths there hawking drones of all shapes and sizes and a bunch of demonstrations where they were flying through the air shooting video of the geeks drooling over their capabilities including myself. There were so many things to see at the show and so many interesting people to talk to. I walked the floor for three straight days until my feet were going to fall-off, but still didn't come close to seeing everything. Although I did see this artist making masterpieces with actual Rubik's Cubes. Just an incredible event. I had never been to Vegas all by myself before, but I kept relatively entertained at night. Some of the vendors had big parties where I was able to go and network and bird-dog opportunities for my company. I also was proud of myself that I stopped by one night club and sang Karaoke to a bunch of strangers. They didn't seem to pay me much attention, but I'm certain deep down inside they were digging it. Late on Tuesday night, I went down town to connect with some of the Hornbuckle clan. It worked out great for me that their annual Vegas vacation event happened to be the same week of a show my company wanted me to attend. On the day my vacation began, I crossed the street and switched hotels to Treasure Island to join the Hornbuckles. Miss Sheri flew in late on Wednesday after my last day of attending NAB and we connected with the rest of the Hornbuckles for supper and our Vegas vacation was ready to begin. Unfortunately, it's some kind of law that what happens in Vegas, stays in Vegas so I can't publish a good portion of my pictures. On Thursday, we went to the Venetian so I could take my lovely wife on a Gondola ride. It's a little odd riding a boat in a building, but extremely romantic none the less. Kim and Mike Bailey joined us for the ride and got extremely romantic with one another also. I walked by this store and was curious by the large crystal skull in the entry way. I really wanted to rub that skull and almost did until I noticed the sign that said "Do not touch the skull!" I asked the lady who worked there "Why?" and she said it was because it cost $60,000. Apparently it was cut from some kind of solid piece of crystal which made it so valuable. I don't know how much money I'd need to have before I could ever justify spending $60,000 on something like this, but I'm guessing it would be quite a bit. On Thursday night, the clan was up to 22 people and we were ready to head downtown for some more debauchery. Hard to hail a cab for 22 people, but lucky we could all fit in a small bus. Later in the evening, a few of us decided that we weren't done exploring the town and we were lucky enough to hail a Hummer Limo to drive us around. I had never used a stripper pole while driving before, but lucky for all of us Chris Hornbuckle really knew how to use one and gave us all some lessons in how to work it. The Hornbuckles told me in order to be invited on their family vacation, I would have to dress out of character every now and then. Normally, I'm pretty shy about dressing silly, but it turned out to be quite fun to break out of my shell for once. 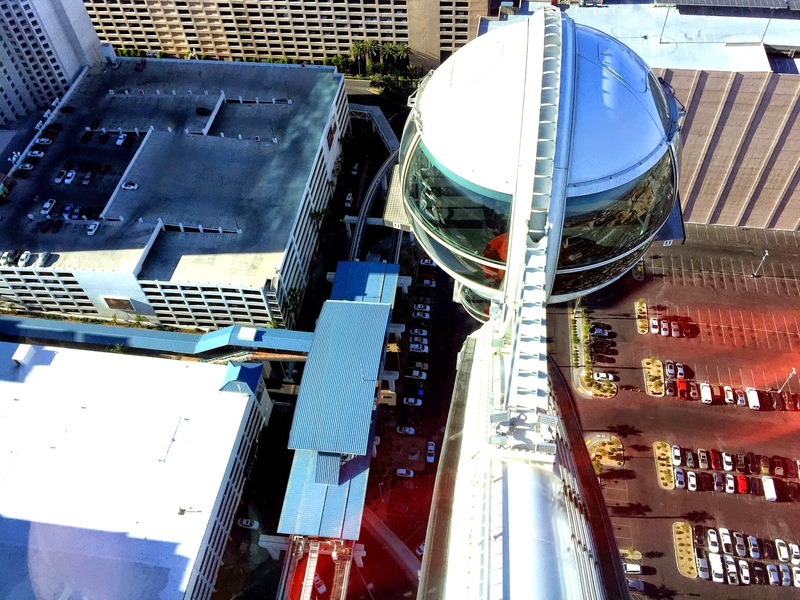 Seeing the high roller hovering over us for a few days just proved to be too tempting for some of us, so on Friday afternoon we decided to take it for a whirl. It's hard to explain how big this ferris wheel is but I was told that each of these cars can hold up to 45 people. We didn't try to fill one of the cars, so I guess I'll just have to take their word for it. 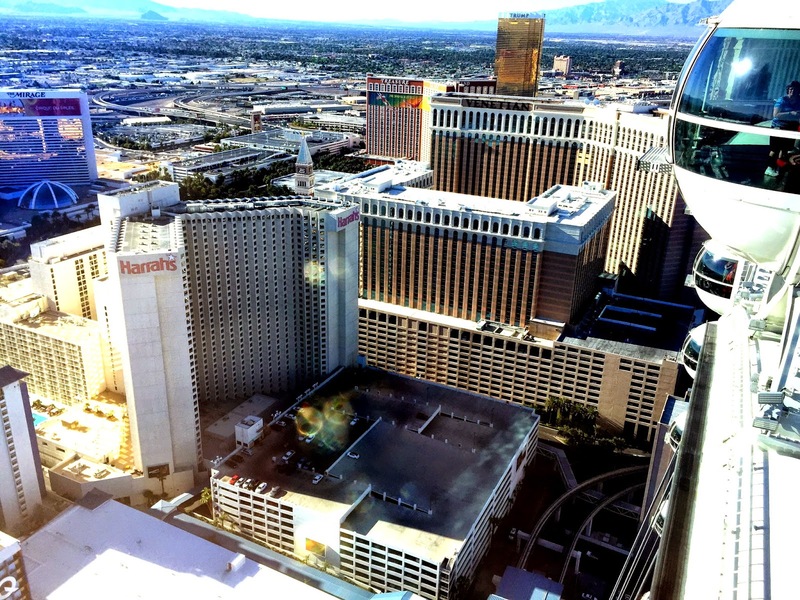 It's is a pretty cool way to see the entire strip and the city around it. I've been wanting to join these guys for one of their Vegas trips for many years now and am happy to have now made it. They're good people.